In 1955, liberalism reigned supreme over the politics of the United States. Both political parties were under the control of their liberal wings. The “respectable” universities and big foundations—where policy ideas were formed—were all liberal. And almost all of the mainstream media—including all three television networks—were liberal. The word “conservative” wasn’t even found in political street usage. If there is one lesson to be learned from this chapter, however, it is: Never despair, and never give up. In November 1955 a new development would go a long way toward challenging this liberal dominance, and in the following five years the new conservative movement would be born. This excerpt is from Chapter 4 (“1955—A Liberal Hegemony over America”) of America’s Right Turn: How Conservatives Used New and Alternative Media to Take Power, by Richard A. Viguerie and David Franke. Count your blessings as you contrast the political desert of 1955 with the conservative proliferation today. In 1955, liberalism reigned supreme over the politics of the United States. But the natives were grumbling – a lot. Why pick this particular year? Look again at the ingredients in our recipe for creating a new mass movement (Chapter 3). In 1955, as we will now see, plenty of issues motivated “the Right” – precursors of what soon became better known as conservatives and libertarians. A dedicated vanguard was developing, but not yet fully formed. Missing was the self-identification as a movement. A lot of grumbling does not a movement make. At the end of 1955, however, a new development would go a long way toward changing that, and in the following five years the new movement would be born. We do not exaggerate when we say that in 1955 liberalism reigned supreme over the politics of the United States. Both political parties were under the control of their liberal wings. 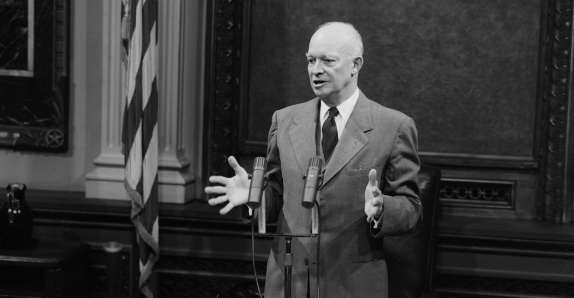 The Democrats were the party of Harry Truman and Adlai Stevenson, while the GOP came under the control of its liberal Eastern wing once Ike decided he was a Republican and became their front man. In Congress, conservatives had their champions even if they didn’t control the agenda or direction of the two parties. In the national media, however, conservatives were nearly shut out. And the national media decided what issues would be discussed, as well as the “correct” positions on those issues. Where did Americans get their news in 1955? Almost entirely from the three television networks and their local newspapers. The slant of TV news content was solidly liberal, without exception, as the names Edward R. Murrow and Walter Cronkite make all too evident. As for local newspapers, many of them were nominally Republican, but any Republican perspective was found only on the editorial page – the least-read section of a newspaper. Then, as now, most reporters were Democrats and liberals, consciously or unconsciously, and they followed the lead of the TV commentators and the major “respectable” papers in terms of what they reported, and how they reported it. The most influential newspapers were virtually all liberal, too. Leading the way in national influence were the New York Times and the Washington Post. Just a year earlier the Post had bought out the Republican Washington Times-Herald, killing its voice through merger and creating a morning newspaper monopoly in the nation’s capital. This was an incredible coup for the liberal establishment. Each morning, lawmakers would get their news and opinion from the liberal Washington Post and in the evening from the liberal television networks, which hardly created an atmosphere for placing conservative or Republican ideas on the agenda. Radio, in 1955, was mostly an entertainment medium rather than a news medium. There were conservative grumblers on the radio – Paul Harvey, John T. Flynn, Clarence Manion, and Fulton Lewis Jr. come to mind – but they had to pay for their commentary time by obtaining sponsors, usually small businesses. They didn’t enjoy the federally granted monopoly of the TV networks, and they had nowhere near the same sized audience. Where was public policy formed? Those ideas were formed primarily in the universities and the foundations, which played the role later assumed by think tanks. Liberals controlled the academy as tightly as they controlled the TV networks, especially in the more prominent “respectable” universities, and liberal academics were just as merciless toward conservative dissenters – this was the heyday of Arthur Schlesinger, Jr., after all. And the foundation world was dominated by liberal giants like the Rockefeller and Ford foundations. They led the way in funding academic and public policy research, and no conservative need apply. All the major book publishers were liberal, and the two most prominent and influential ideological periodicals were The Nation and The New Republic – both leftist. The three most prominent conservative voices were the Chicago Tribune, Reader’s Digest, and David Lawrence’s U.S. News. The Digest was never that influential politically, however, as its main thrust was to provide middlebrow audiences with easy-to-read articles and books on nonpolitical topics. The Tribune, while owner Colonel McCormick was alive, was influential, but only in the midwestern heartland. Elsewhere it was routinely disparaged by the liberal establishment, and it held little influence on Washington as compared to the New York Times and the Washington Post. David Lawrence brought a businessman’s common sense to matters of public policy, both in his weekly U.S. News and in his widely distributed newspaper column, but his influence was nowhere on the order of that of Time or Newsweek. Put together all the influential media and you get a score of something like liberals 95, conservatives 5. Or perhaps it was more like 97/3. That’s the sort of monopoly enjoyed by Pravda in its Soviet heyday. Bear in mind that this liberal media monopoly existed even while the country, then as now, was overwhelmingly conservative (little “c”) in its social character, and probably somewhat evenly divided politically between liberals and conservatives. (There were more liberals then than now because we were closer to the Great Depression. There were also more Democrats than Republicans, because the conservatives in the South were Democrats.) When you have that sort of imbalance between the nation’s people and the nation’s opinion leaders, a considerable amount of dissident grumbling is likely to be going on, even if underground. And it was. This was an era, after all, when communism was thought to be in almost inevitable ascendancy – by the Right as well as the Left. Communist armies had taken over much of the world; their political operatives had created an international propaganda and proselytizing apparatus unlike anything that had existed before in history; and at home in the United States, more Soviet spies and fellow-travelers were busy transferring secrets to the Soviet Union than even Joe McCarthy could have imagined (as we later learned from Soviet archives and defectors). This was the era of “who lost China?” and “who promoted Peress?” The era of our nonvictory in Korea, President Truman’s dismissal of General MacArthur, the Alger Hiss and Julius and Ethel Rosenberg trials, and the soon-to-come Hungarian revolution (and our betrayal of it). Through it all, nearly all of the Left defended the two biggest butchers of our time – Stalin and Mao – and most liberals at the least felt we had to be accommodating toward them, making concession after concession. Communism, in short, was the most important issue in 1955 for the people who would become the conservative movement. Which is not to say that it was the only issue. Labor unions were at the height of their power, pursuing a leftist agenda. Foreign aid was a hot topic. National sovereignty (the United Nations, the Bricker Amendment) was another. Conservatives and libertarians were united on all these issues – their split over “social” issues would come in the future. Not that it was all peace and harmony on the Right. Libertarians and many conservatives were believers in the noninterventionist approach to foreign policy so prominently advocated by America First in the years before World War II, while most conservatives thought the United States must stand up militarily to communism even if war was the result. Their complaint wasn’t that we went to war in Korea, for example, but rather that the Democratic administration had not let our troops win, and had us fighting under the United Nations flag. Eventually these divergences on foreign policy and economic emphasis would lead to a split between the conservatives and libertarians. The conservatives would become primarily enmeshed in political activism, while the libertarians mostly followed more academic pursuits. Both would be successful, with the conservatives taking over the Republican Party and then the presidency, and with the libertarians providing the intellectual and economic foundation for the worldwide triumph of free markets over collectivism. But for now, in 1955, all of that was just a pipedream for the most ambitious and optimistic members of both camps.